Probably made at Winchester, although it is not certain by or for which religious house there, the Arundel Psalter seems to have been a personal prayerbook. Use of the psalter in the middle ages could be for church services or personal prayer. Individualistic choices of saints for its calendar as well as Old English glosses on the Latin text suggest this one was made for private prayer. The first letter of Psalm 1 ('Beatus vir', 'Blessed the man') usually receives the most elaborate decoration of all the Psalms, as it does here. Within it appear a figure of a man climbing a vine and, below, a picture of King David composing the psalms, a conventional portrait of him as author. 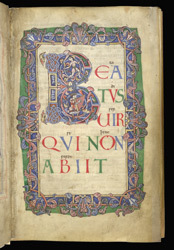 This initial was painted years after text of the Psalm was written. Between the lines, the small script gives an Old English translation, which shows it was written before the Norman conquest, probably about 1060. The style of the painting, however, is more like that of Normandy and northern France, in the last quarter of the century.